Urbana High School alumnus Sgt. 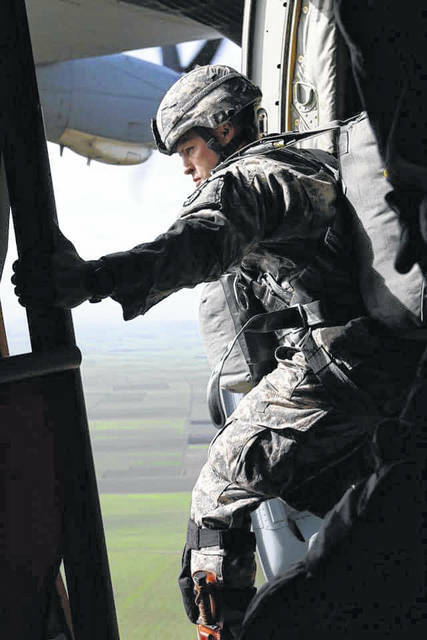 1st Class Matthew Deane, currently a ranger instructor with the Army’s 5th Ranger Training Battalion, prepares to jump from an airplane on one of his 68 jumps. Urbana High School alumnus Sgt. 1st Class Matthew Deane, currently a ranger instructor with the Army’s 5th Ranger Training Battalion, has been selected to participate in a commemorative D-Day jump over Normandy, France, on June 6. Deane joined the Army as a cavalry scout shortly after graduating from UHS in 2004, then later decided to become a ranger and has made 68 jumps. Deane was selected for this trip after beating out seven other non-commissioned officers from his battalion at an NCO of the quarter board competition in which his superiors graded him on military knowledge. He departed for France on Memorial Day with two other people from his battalion and meet with other soldiers from the Airborne Ranger Training Brigade upon arrival. On June 6, 1944, Allies invaded Normandy, France, in the largest seaborne invasion in history, which began the liberation of German-occupied northwestern Europe from Nazi control during WWII. Deane said he has been a WWII buff ever since watching the HBO war drama “Band of Brothers” and looks forward to seeing the sites of the Normandy landing, including Pointe du Hoc, where Germany artillery gunners were neutralized at the beginning of the invasion by American rangers. Deane said he joined the Army for travel opportunities and has since been all over the world, including three deployments, two to Afghanistan and one to Kosovo. His parents, Chris and Kim Deane, live in Urbana and say they are proud of their son.